The Nuclear magnetic resonance spectroscopy is a powerful method for the characterization of the exact structure of compounds. Here we illustrate the use of two dimensional NMR in the structure elucidation and other specialized application of NMR. 1H-1H correlation or COSY experiments let protons to be coupled to one other. The figure below illustrates the correlated spectroscopy spectrum of aspirin. The diagonal provides the correlation of the signals themselves that is, A with A, B with B and so on. On either side of the diagonal, similar information is presented; therefore only one diagonal is needed for spectral interpretation. From the spectra, it can be observe that A is coupled to C, B is coupled to C and D; and C is weakly coupled to D through long-range meta-coupling. COSY has simplified the interpretation of complex NMR spectra. There are a number of methods stemming from the fundamental two-dimensional method, which for illustration, allows correlation between the carbon atoms and protons linked to them and correlations of carbon atoms having protons one or two bonds eliminated from them, heteronuclear multiple bond correlation (HMBC). 1) Determination of the impurities comprises enantiomeric impurities without separation down to ca 10% level. The benefit of this process of quantization is that a pure external standard for the drug is not needed as the response is purely proportional to the number of protons present and this can be measured against the pure internal standard. Therefore, the purity of a substance can now be found out without a pure standard for it being available. 3) NMR has been developed lately, in conjunction by the chemometrics, as a tool for the diagnosis of disease. For such purposes it is often interfaced by HPLC. It has as well found broad application in the magnetic resonance imaging, a method that might be employed for imaging soft tissues by using NMR signal generated by the protons within the tissues. 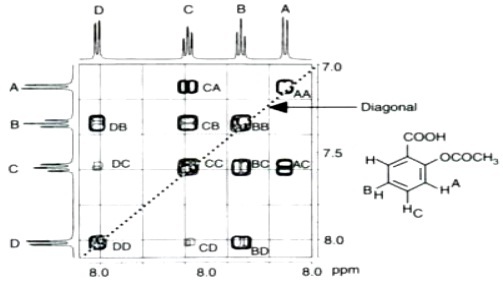 LC-NMR has as well found application in the drug metabolic studies.